Sir Joseph Austen Chamberlain, KG (16 October 1863 – 17 March 1937) was a British politician. He received the Nobel Peace Prize in 1925. His father was another important politician, Joseph Chamberlain, and his half-brother (they had a different mother) was Neville Chamberlain, British Prime Minister from 1937 to 1940. Austen was born in Birmingham on the 16 October 1863, but two days later his mother died. His grandparents looked after him and his sister, Beatrice. Austen went to Rugby school, a famous private school, and then studied at the University of Cambridge. He then studied in a political college in Paris and at a university in Berlin. He returned to Britain in 1888. In 1892, Chamberlain became a Member of Parliament for Worcestershire, as a member of his father's party, the Liberal Unionist Party. The Liberal Unionists worked to keep Ireland as a part of the United Kingdom. Chamberlain worked hard for his father, and in 1895 the prime minister gave him a job helping to run the Royal Navy. Chamberlain became important very quickly. In 1903 the new prime minister, Balfour gave him the job of controlling the Post Office. Then in 1904 he became Chancellor of the Exchequer, responsible for the economy. In 1906, the government lost the general election, and Chamberlain lost his job in the government. When his father became ill because of a stroke, he helped his father by fighting against Home Rule, the plan to make Ireland independent. In the First World War, Chamberlain got the job responsible for India, and after the war he became Chancellor of the Exchequer again. Here he helped Britain to recover from the war. He was leader of the Conservative Party from 1921 to 1922. In 1924, the Prime Minister Stanley Baldwin gave Chamberlain the job of Foreign Secretary, working with important people from other countries. In 1925. At this time, France and Germany were arguing about war reparations, money paid by the Germans to the countries that won the First World War. Many people were worried that war might start again. Chamberlain met with Gustav Stresemann, the German Foreign secretary. Together with Aristide Briand, they signed the Locarno Pact, an agreement never to use the military to solve problems again. For this, all three men won the Nobel Peace Prize, Chamberlain in 1925, Briand and Stresemann in 1926. After the 1929 general election, Chamberlain lost his job as Foreign Secretary. He stayed in parliament, and often argued with the government about their foreign policy (plans). From 1934 until his death in 1937, Chamberlain warned the government about the Nazi Germany, who were building a larger military. Together with Winston Churchill, he argued that Britain should build its military too. 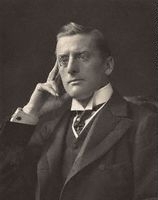 Austen Chamberlain died on 17 March 1937, shortly before his half-brother, Neville Chamberlain became Prime Minister. David Dutton, Austen Chamberlain – Gentleman in Politics, Bolton: R. Anderson, 1985. This page was last changed on 13 February 2019, at 19:47.